It seems that every few weeks, I have something new to dread. That is the curse of having and living with cancer. Always a new test, treatment and now this. I have made it over many humps at this point including my mastectomy and first chemotherapy treatment. But now the time has come where not only do I have cancer, I will look like I have cancer. I have been doing everything possible to prepare for this point; thinking about it, talking to others about their experience, cutting my hair short so I could see what I might look like, giving myself pep talks…. But I don’t think any of it has really worked. I am starting to dread it, even convince myself that it is not going to happen. I wrote to my nurse (my oncologist’s assistant) yesterday to double check on what I should expect. 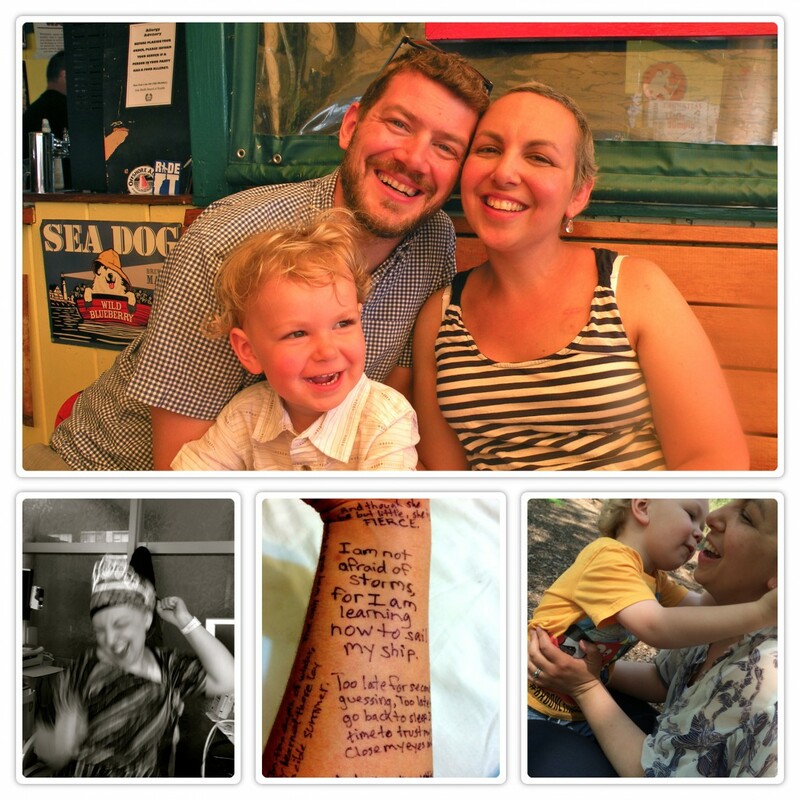 I hoped that she’d write that, “Well, not everyone loses their hair on this chemotherapy treatment. You stand a chance.” But that is not what I heard from her. “Hair loss typically begins 2 weeks after first treatment, so right around the time of your next infusion.” That’s on Wednesday. Anyway, since that’s not going to happen, I spent the afternoon playing with some scarves, hats and pins to get ready for going out on Wednesday. I am still getting a wig from Hair We Share but it will not be ready for several weeks and I have not bought a backup. Probably because of the denial I’ve been in. I did a little more searching but couldn’t commit to anything. It just didn’t feel right. So here are a few of the scarf ties I have been playing with. Wrap I received from Hope Scarves. Isn’t it beautiful and it’s so soft. 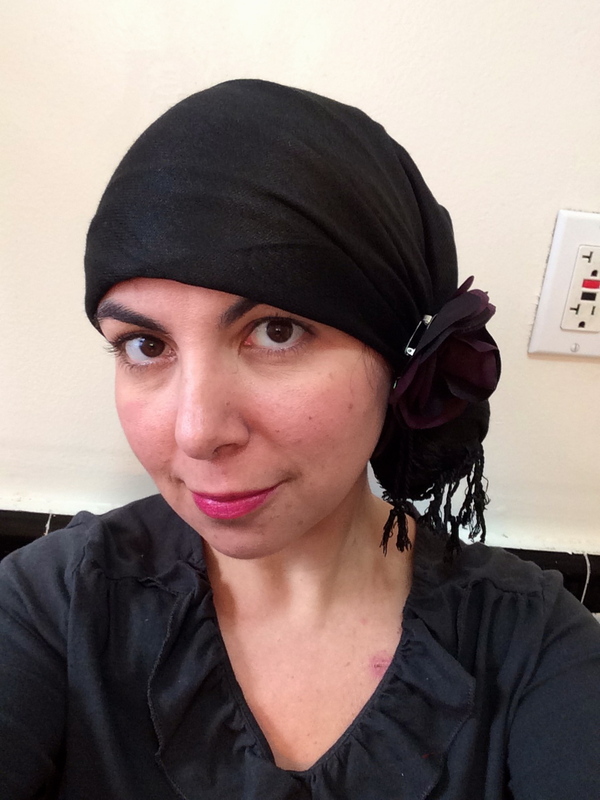 Simple black pashmina scarf with a side chignon and a dark purple rose pin at the side. 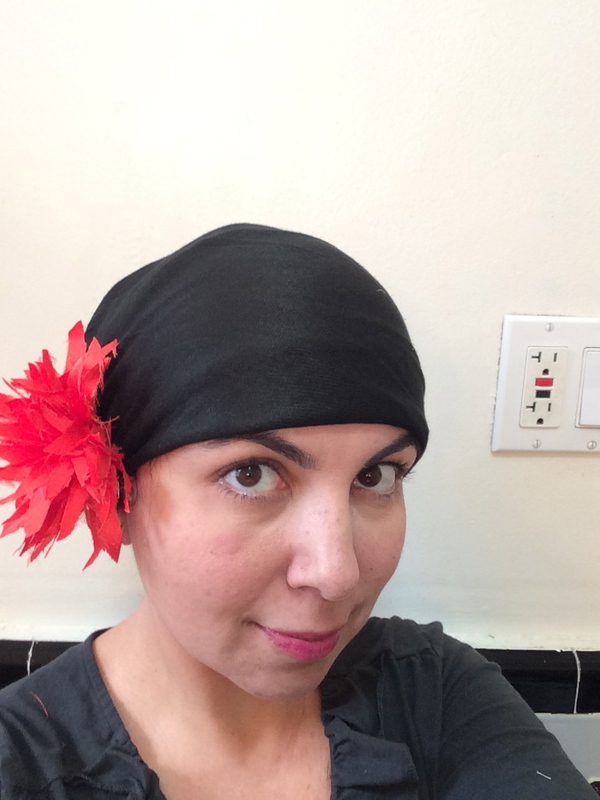 Black pashmina scarf tied in a bun with a funky red pin at the side. Same pashmina scarf with bun but a bow headband as a decorative accent. My going out “Grey Gardens” look. 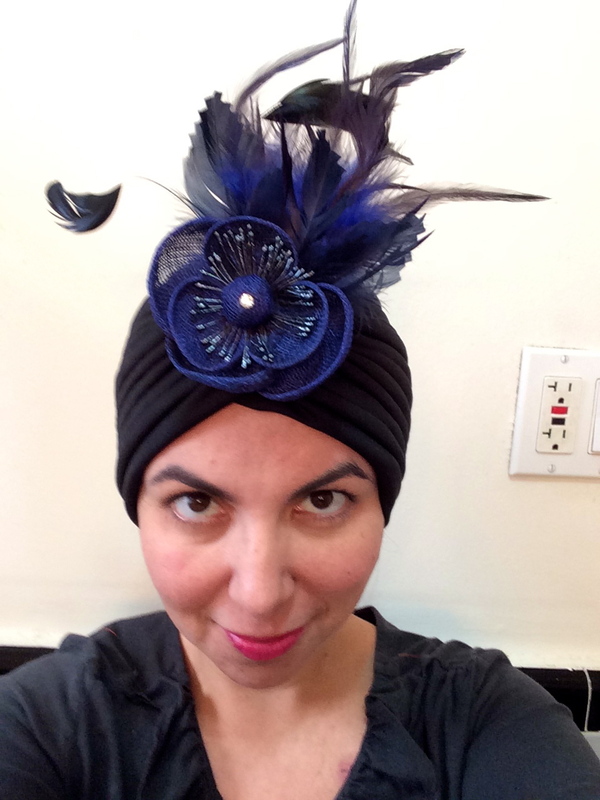 A black turban hat with a feather pin in the middle. Black pashmina scarf with a front knot. 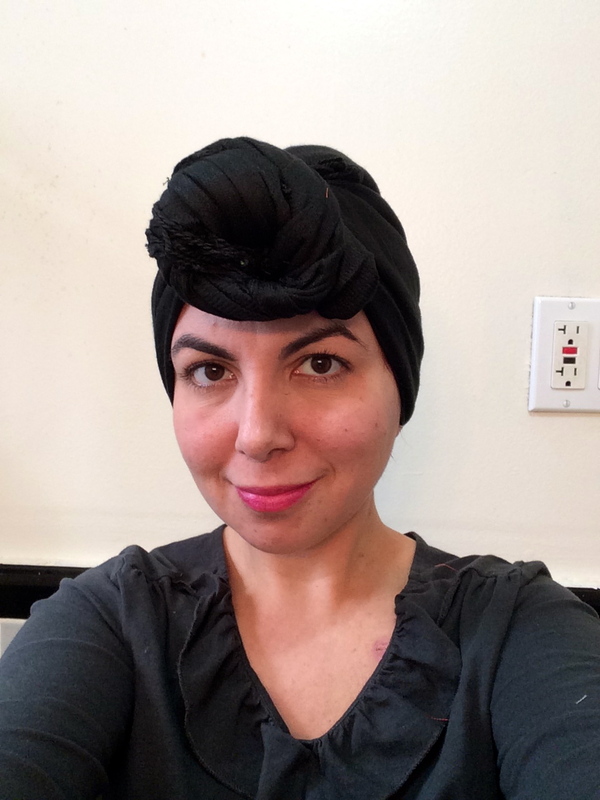 Black scarf with bun in the back and a satin head scarf wrapped on top. What do you think? I learned how to tie some of these scarves by watching videos on a great site, 50 Ways To Tie A Scarf by The Knot Library. 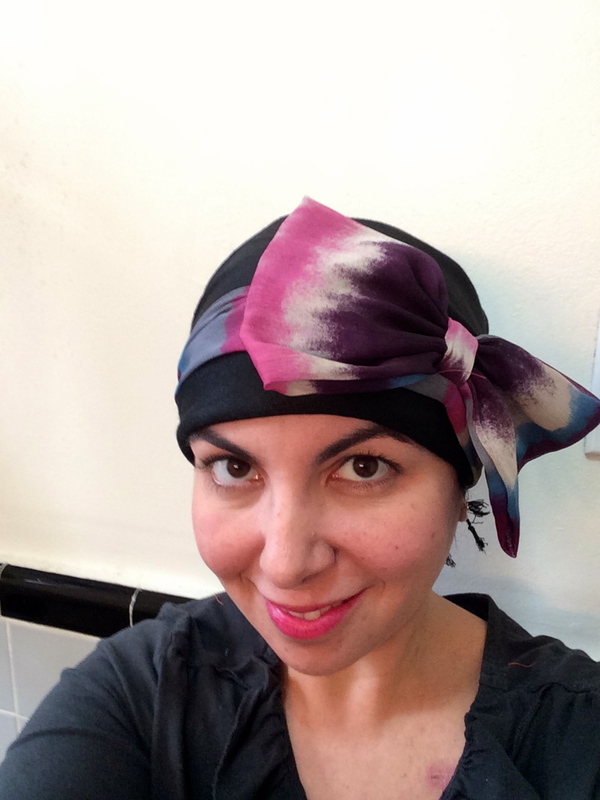 It is a great resource if you want to learn great ways to wear your scarf on your head or even around your neck and the tutorials are very easy to follow. This girl has a lot of great ideas as well. Lastly, I would like to give a shout-out to a wonderful organization called Hope Scarves. Hope Scarves in an amazing, amazing organization whose mission it is to “partner survivors to share scarves and stories with women facing cancer.” It was started by a woman named Lara MacGregor who was diagnosed with breast cancer at age 30 and 6 years later, in January 2014, after being cancer free, was diagnosed with stage IV metastatic breast cancer. Anyone who is facing cancer and it’s treatments can write to request a scarf. You are then partnered with a survivor and will be sent a scarf along with a story from the woman who sent it to you. Many of the scarves sent are scarves that were sent to them when they applied to the program! The scarf that I am wearing in my first picture is my Hope scarf. Isn’t it beautiful? It’s super soft too. It was sent to me by a woman who was diagnosed with breast cancer at age 35 and is a mom of 2. To hear her story and her words of encouragement touched me even more than receiving the scarf. 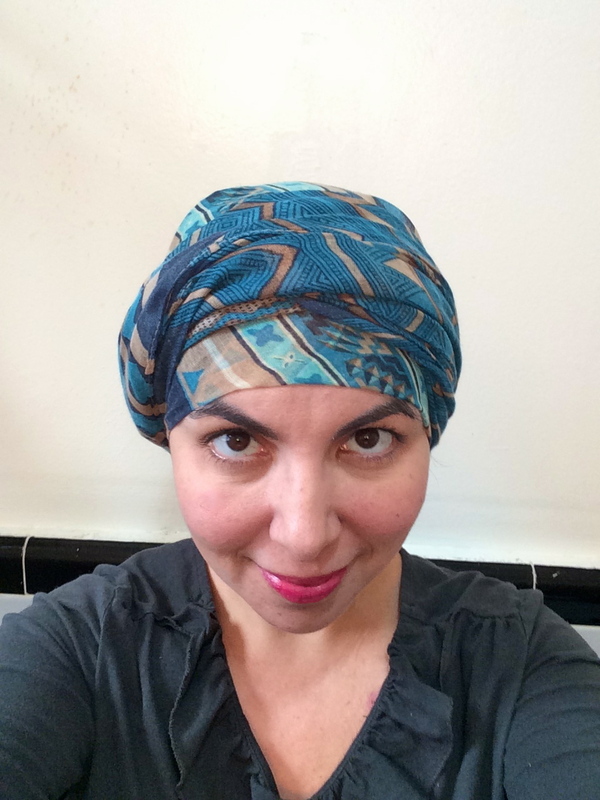 If you are going through chemo, I highly recommend that you look into Hope Scarves. I can’t wait until I’m cancer free so I can be for someone what my partner is now to me. Something to look forward to. Because I think Hope Scarves is so great, I’m going to put their donation page here. I know from personal experience that it goes to a good cause. Do you have special ways you like to tie a scarf? Any amazing resources? Please share in the comments area for all to see and learn from. 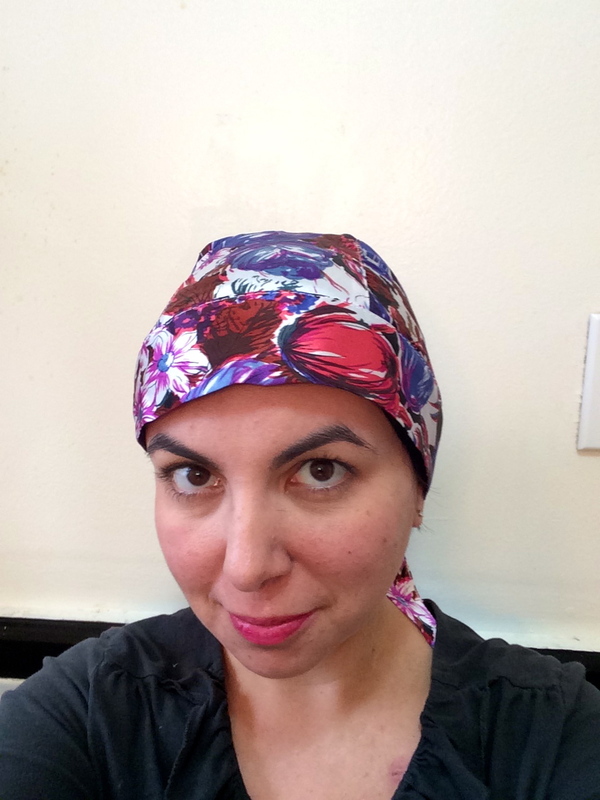 Categories: Uncategorized | Tags: chemotherapy, hair loss, hair ties, scarves | Permalink. How can I get these marathon passes to you? Should I give them to your mom? Is that 1 through 5 or 1 and 5? I’ll email you about the passes. Grey Gardens!! All day! Every day! Would you like a scarf? I would love to give one to you. Bet you’d be the recipient of a lot of “love you!” scarves from friends, if you wanted them, and be able to wrap your beautiful head in some love energy every day. You’re too sweet! Thank you, Elly! Yes, I will try to schedule my chemo infusion around the performance. I’ll bring in then then ❤ Sending you healthy healing vibes. I like 3, 4 and 5! I only had one hat during chemo and it was to keep my head warm but it would have been nice to have more options. I never came out of the house and slept most of the time. This is simply amazing. Nice work and nice post too. Keep it up. Wearing hair wrap, is really a great idea. And believe me ladies, you all are looking damn pretty with satin hair wrap on head. Thank you for reading and I’m glad you enjoyed this post.